Although the 2010 Credit Card Act is aimed to protect against unfair credit card billing practices, a report by Debt Free League indicates that to offset the loss of profits, credit card companies crafted schemes, hitting cardholders’ accounts with new fees and increased interest rates. Defiantly, the company offers a debt settlement solution. For America’s credit card nation, a new credit card law may have brought more bad than good. This March, the Credit Card Accountability Responsibility and Disclosure Act (Credit Card Act) went in effect to shield consumers from abusive credit card billing practices. But a Debt Free League report warns the outcome produced abusive interest rates and fees. Deepening consumer’s worries, banks also introduced a variety of new fees, such as paper statement processing fees, inactivity fees on accounts that have not been charged on for six months, and reinstatement fees to reinstate accumulated rewards. “The Credit Card Act reflects the infinite enslavement to credit card debt if you make the minimum payment. The good news is that Debt Free League can offer a wealth of debt settlement opportunities to people with collection and charge off accounts”, utters Santacruz. 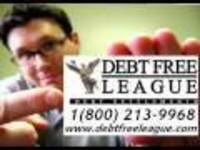 Video - Debt Free League Medical debt reduction press releasePress Release Video - Medical deb reduction of Debt Free League client.